Level 1: Driver Assistance: Driver receives assist from either steering or acceleration/deceleration using the information from about the driving environment. Level 2: Partial Automation: Both steering and acceleration/deceleration will be controlled by the system. Driver still has to perform all remaining aspects of the driving task. Level 3: Conditional Automation: Automated driving system can now perform all aspects of the driving task but still need the control from the driver when needed. 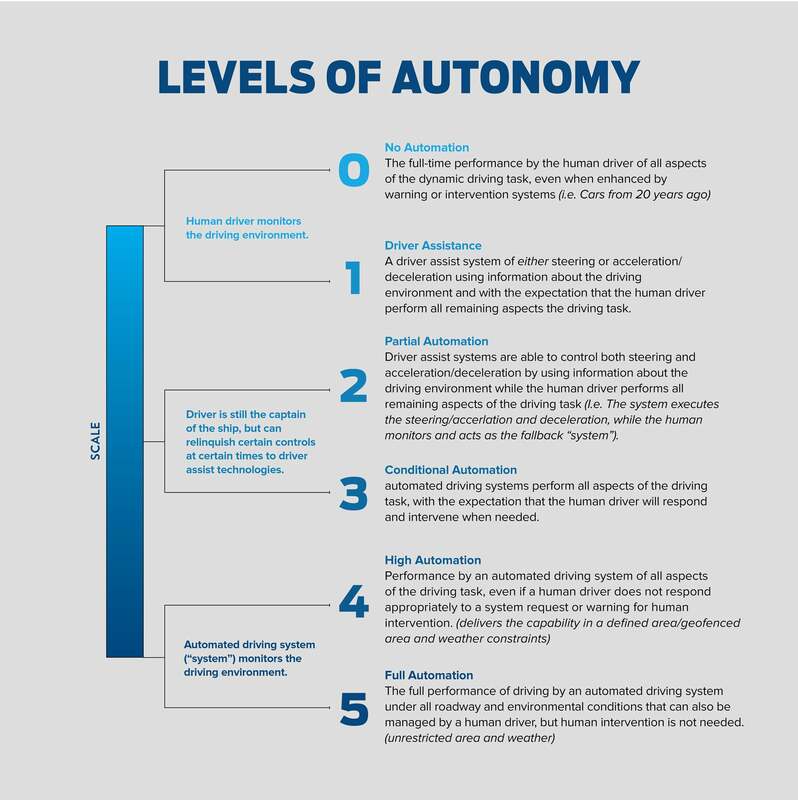 Level 4: High Automation: Performance by an automated driving system of all aspects of the driving task, even if a human driver does not respond appropriately to a system request or warning for human intervention. (deliver the capability in a defined area/geofenced area and weather constraints). Level 5: Full Automation: The full performance of driving by an automated driving system under all roadway and environmental conditions that can also be managed by a human driver, but human intervention is not needed (unrestricted area and weather). A product from the Google Self Driving project. Was aimed to create a safer, easier and faster solution for people and things to move around. There is already the early access rider program in 2017. Has eight cameras provide 360 degrees of visibility around the car at up to 250 meters of range. Twelve updated ultrasonic sensors complement this vision, allowing for detection of both hard and soft objects at nearly twice the distance of the prior system. A forward-facing radar with enhanced processing provides additional data about the world on a redundant wavelength that is able to see through heavy rain, fog, dust and even the car ahead. Equipped with a new processor which is 40 times faster than a normal computer. They want to sell this car all over the world. Both Waymo and Tesla Model S will be classified as level 5 because they are equipped with cameras, censors, provide full auto pilot feature, and can work in all roadway and environmental conditions that can be managed by a human driver without any response or request from the driver. Autonomous Vehicles (AVs) can drive on their own without any request or response from the driver that makes them have more times for other important things, the result from a research provide the information that AVs could free as much as 50 minutes a day for users. AVs can go to the parking-lot automatic which is better than a driver in most cases, some self-parking AVs don't even require open-door space for dropping off passenger when parked. AVs could change the mobility behavior of consumers, potentially reducing the need for parking space in the United States by more than 5.7 billion square meters.